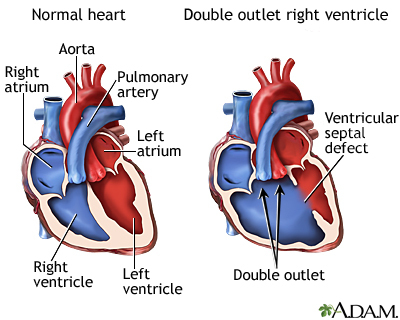 Double outlet right ventricle (DORV) is a congenital heart disease in which the aorta and pulmonary artery rise from the right ventricle. This configuration allows oxygen-poor blood, to be carried throughout the body. The body is not able to get enough oxygen, causing the heart to work harder to try to bring more oxygen-rich blood to the body.